This is an oldie, but a goodie! 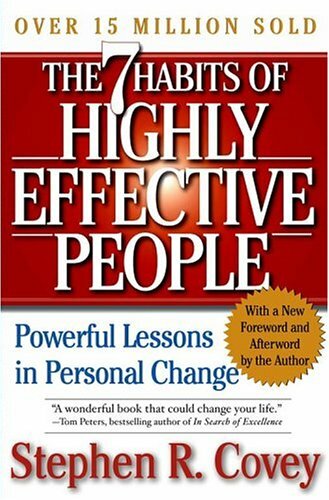 It took me a while to discover The Seven Habits of Highly Effective People by Stephen Covey. It wasn’t recommended to me by anyone. I was simply browsing a local bookstore and the title caught my attention. I figured it wouldn’t hurt to read it because I was feeling particularly ineffective at the time! The holidays were approaching and I was looking for a book to read on the beach at Byron Bay. All I remember now, is feeling that this book must have been written about me. It identified at least seven areas that I needed to change… urgently! Since this time, over 20 years ago, I’ve reread this book or parts of it numerous times. I still believe it’s one of the most helpful ‘personal organisation/time management/self help’ type books available. So if you’re feeling a little disorganised, don’t have enough hours in the day or days in the month, feeling overworked and underproductive, then I recommend dipping into the 7 habits. This book stands apart from many contemporary ‘success’ or ‘personal management’ books, in that it focuses on character and principle-centred living. It’s not full of techniques, tricks, or tools, for getting ahead. Rather, it pushes the reader to focus on what matters matter most, so as to ensure that these values shape the way we live. This book deals with internal personal transformation as well as external interpersonal relationships. It seeks to help us reshape our lives so as to create sustainable changes for the better. I will introduce each of the 7 habits, before offering some reflections on the usefulness and limitations of Covey’s approach. We have a tendency to see life as the product of our circumstances. We inherit traits from our parents and grandparents. The environment we grow up in, learn in, work in, live in, is said to determine how we will deal with the stuff that comes our way. Covey critiques this reactionary outlook on life, reminding us that we have the freedom to choose what happens between stimulus and response. Proactive people are driven by principles rather than circumstances. They have response-ability. The proactive person is focused on their circle of influence which is a subset of their wider circle of concern. There are somethings we can’t change and there is no point being all consumed with these. Rather we become more effective as we focus our energy in areas where we have direct or indirect control. Covey illustrates the second habit by asking the reader to envisage their own funeral. We are invited to imagine the eulogy. How will we be remembered? What do we want people to be saying about us? What type of a person are we? We’re encouraged to look to the end and ask what we need to do in order to get there. The suggestion is made to develop a personal mission statement as a guide to a principle-centred life. This exercise pushes us to consider what matters most, what we value in life, what shapes and drives our choices. This habit challenges traditional ways of looking at time management. It moves beyond ‘to do’ lists, calendars and diaries, and even priority listing. Covey describes his approach as fourth generational time management that includes people and relationship needs alongside efficiency and results. He suggests we identify our key relational roles, set goals in each area, schedule weekly to address our goals, and adapt daily as required. All activities can be defined as either important or unimportant, and urgent or non-urgent. Covey introduces a matrix to illustrate these variables and help us to put first things first. He argues that the more time we spend in quadrant 2, on non-urgent and important activity, the less time we need to spend on urgent matters, the less we experience burn out, and the more our personal effectiveness increases. First, see the problem from the other point of view. Really seek to understand and give expression to the needs and concerns of the other party as well as or better that they can themselves. Second, identify the key issues and concerns (not positions) involved. I trust you can see the problem! In order to understand another person we need to listen to them. Empathic listening is required. We listen so as to understand, and then we get to communicate so as to be understood. In fact, we will do a far better job of communication if we’ve made the effort to understand the listener before we express our views. 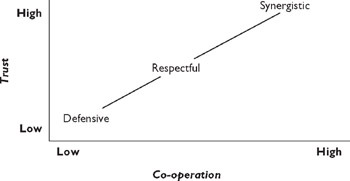 In order to achieve synergy, there needs to be high levels of trust and high levels of cooperation. This opens the door to creative outcomes and solutions. When there’s a lack of trust and cooperation, conflict, deadlock or compromise, may be the best that can be achieved. Synergy is achieved through the application of putting first things first, seeking to understand before seeking to be understood, and looking for win/win solutions. Covey describes the search for synergy as fishing for the third alternative. His more recent book entitled The 3rd Alternative examines this in much more detail. This habit is focused on personal renewal. It’s illustrated by the story of a wood-cutter who takes a couple of minutes each hour to sharpen his saw, resulting in far greater effectiveness than the one who perseveres long and hard with a blunt saw. Covey identifies four dimensions to the self: physical, mental, social/emotional, and spiritual. He argues that a balanced lifestyle, that cares for and nurtures the self, will have a profound impact on personal effectiveness. The physical dimension translates into issues of diet, exercise, rest and relaxation, and there are no quick fixes. He identifies such factors as prayer, meditation, religious literature, and music, in the spiritual dimension. The mental dimension means investing in the mind, strengthening and enriching it by reading, study and continued education. The social and emotional dimensions are tied together because of the significant impact of relationships on our emotional wellbeing. All four dimensions are important and the neglect of any will impact the other three. This book had a profound influence on me, especially as I sought to juggle or balance many important roles and responsibilities in life. How could I make investments in being a husband, a dad, a team leader, a pastor, a sports chaplain, a preacher/teacher, a trainer, and various other things all at the same time? I seemed to keep spending my life dropping one ball after another. I’d ignore some areas (often of vital importance) simply because other things had become more pressing. Covey’s approach encouraged me to pay attention to each of my major roles every week. It urged me to focus on quadrant 2, non-urgent and important, activities. These are the activities that reap the greatest rewards down the track and they help keep us from being run ragged by the urgent. 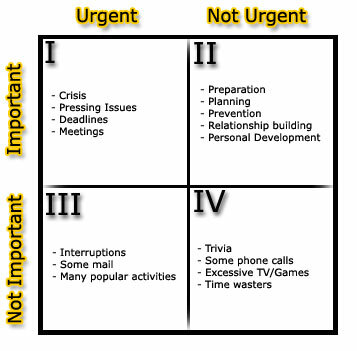 It also helped me understand why I often found myself in quadrant 4, the non-urgent and unimportant. This is the burnout zone, where you hide when you can no longer cope with all the demands upon you. I followed this guide on a regular basis and encouraged our staff and trainees to do the same. It was very helpful. The emphasis on effectiveness over efficiency was especially important. I made sure I was investing in personal renewal areas. I’d keep developing long-term important goals and working towards them. I’d set aside time to reflect and examine how things were going, to plan and set a new course for the future. I even purchased a Seven Habits Diary to help me get it all together! As a Christian I found that much of this book resonated with me, and it offered a framework for personal and time management that I could use consistently with my beliefs and values. My understanding is that Stephen Covey was not a Christian, but a member of the Church of Jesus Christ of Latter-Day Saints. While I’m certainly not a Mormon, and do not follow Mormon teaching, I found there was much in this book that I could apply to my life without compromising or abandoning my own beliefs. But herein lies an important issue. We need to be clear on what our beliefs are. How can we assess the importance or relevance of these particular habits? What do we value? What really matters in life? What is the end that we should be heading towards? Covey’s book won’t answer these questions. If we have no clear principles, then we’re not going to find them by reading this or many other self-help type books. 7 Habits makes assumptions and claims about what matters matter that are based primarily on observation and experience. Some will read them and agree, others will look in other places. I look to the Bible for my answers to these significant questions. I find my compass for life, as I trust in Jesus Christ and seek to follow his lead. The Bible offers me a guiding light for life and decision making. It shows me that wisdom is to be found by respecting God and honouring him in my thoughts, words and actions. Jesus provides the supreme example of one who truly began with the end in mind and followed this all through his life. He came to seek and to save the lost, knowing fully that it would cost him his life. He put the needs of others above his own. He depended on his heavenly Father and made time to escape the heavy demands upon him to spend time in prayer. He entrusted himself to God, in the face of of opposition and execution, for the greater goal of offering forgiveness and reconciliation to all. If your life feels out of control, if you’re running on empty, dropping important balls all over the place, drowning in endless tasks, or dissolving into trivia… can I encourage you to take a step back and look at who you are and where you’re headed. I recommend you take a good look at the Bible, as I’m persuaded that it offers you the most accurate compass to follow. And if you’ve got that worked out, then I think you could do a lot worse than thinking through each of these 7 habits.